"The Dean" Gene Colan spoke with CBR about his career and the forthcoming Hero Initiative book "The Invincible Gene Colan"... check it out! If you've enjoyed the recent What If? Daredevil vs Elektra one-shot, I've posted a new interview with editor Justin F. Gabrie, where he reveals some interesting backstory on the tale. Hope you guys enjoy it and enjoy the holidays! March 2010 solicits are up, and Daredevil #506 is not listed... although there are some DD-related items, including Parts of a Hole, Guardian Devil, Daredevil Noir and Deadpool Suicide Kings... hopefully the delay will be short-lived as Antony Johnston and Marco Checchetto are on board with Andy Diggle for #505-507. "There's no DD in March as we get the schedule in order, and as Andy prepares for the larger project that's creating all this kerfluffle (sic)." Could this larger project be "Shadow Land"? Forthcoming Daredevil co-writer Antony Johnston speaks with CBR's Shaun Manning about his book Wasteland and what's in store for Daredevil starting with issue #505! Been doing A LOT of updating this month (check out the What's New section), including many additions of Elektra fan costume pics submitted by Yaya, Meagan and Giorgia. If you've got any DD or Elektra pics you want to submit, please e-mail me. The first review is now up for Daredevil 503 at Comics Bulletin... as they come in, I will update the list on the front of the site and the reviews section! The preview for the special What If? Daredevil vs Elektra one-shot is now up... SPOILERS! Next week's preview is now up... SPOILERS ahead of course! Be sure to check back all this week as I continue to add more past "first look" previews that are DD-related. I've already added issues 44, 47, 55, 58, 67, 68, 79 & 83, as well as Captain Universe/Daredevil, Elektra: Glimpse and Echo #1 and the DD Movie Adaptation. I plan to add 3-4 albums every day. There's another new section on the site today, this time a new page devoted to all the people who have portrayed Daredevil in various forms of media. Have a look, you may be surprised at how many people there are! * Spent a couple of days adding over 35 TITLES to the site. Hope you guys like the addition of the interviews as well to the front page. I just now realized I have over 100 interviews with DD creators. I never thought that would happen when I first started back in '96. * Some bad news to share... unfortunately I've lost my job, so I'm not sure how this will affect the site... maybe I'll have more time to work on the site, or maybe not. So if you see the site not updated as much as before, I hope you understand. If you're got a moment, please do visit the VisionComix site... every click counts and helps offset the costs of running the site. If you live in the Toronto area and know of any web development positions open, please email me. Thanks! This week only, you can read Daredevil Noir #1 for free at Marvel.com! If you like what you read, you can pick up the just released hardcover at your local shop. Also be sure to read my interview with writer Alex Irvine and artist Tomm Coker! 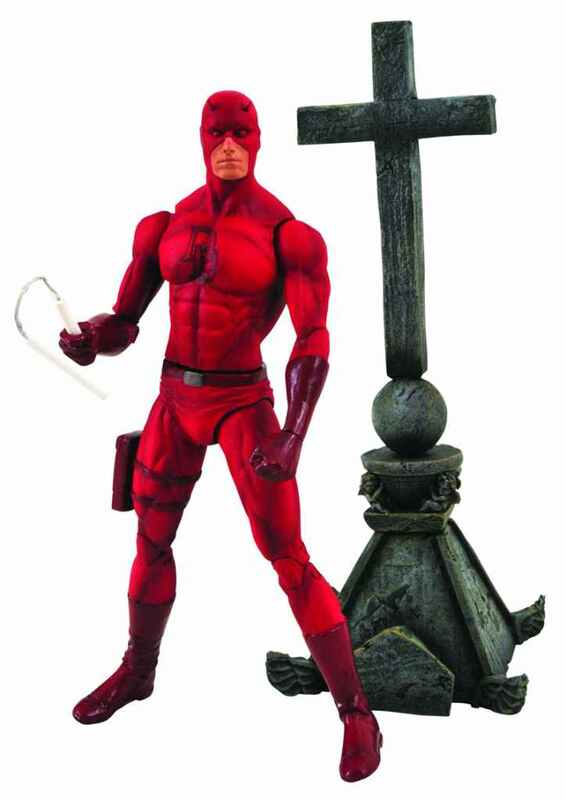 Art Asylum has posted new images of the latest Marvel Select action figure, and this time it's Daredevil! Have a look at the pics! Just a reminder that the second printing variant cover to Daredevil #501 ships this week! The red hot creative team of Andy Diggle and artist Roberto De La Torre take the reins of Daredevil and send him into deadly uncharted territory! Matt Murdock accepts leadership of the murderous Hand ninjas, but does he follow through with the ultimate sacrifice they require? Meanwhile, the Kingpin names a new lieutenant and begins his newest plan. This is the perfect jumping on point for this critically acclaimed series! Plus, this second printing features De La Torre's stunning interior artwork on the cover! I recently got in touch with one of the designers of the Marvel Superheroes Science Exhibit that you may remember from a few years back. This led to me creating a new section for the site, namely "Sightings". I've added the science exhibit and also the DD game from the "Adventure City" in Niagara Falls. If you've got pics of DD-related items from amusement parks, restaurants, movie banners/props from the theatre, you name it, please contact me! Full solicits are now up on the site... looks like Marco Checchetto will be helping out with art on this new arc... along with Antony Johnston helping write, and Paolo Rivera on covers... and there will be a special variant. Also posted are the final issues for the two Black Widow series, the Daredevil Lone Stranger TPB, Essential DD Vol. 5 and the second Brubaker/Lark Omnibus! Writer Antony Johnston revealed today through Twitter that he will be co-writing Daredevil #505-507 with Andy Diggle. Johnston is probably best known for his Wasteland series by Oni Press. Marvel.com has a new interview with Black Widow: Deadly Origin writer Paul Cornell... a reminder that the first issue ships this week! Just a reminder that the second printing of Dark Reign: The List - Daredevil #1 (with a new cover by Billy Tan) ships this week. DD Stephen Wacker, as part of his "Tweetumentary" at Newsarama, previewed some Daredevil artwork... namely a sketch from Daredevil #505 (spoilers for that one, as it hints of the storyline after the current arc) and a coloured page from Daredevil #502... so, click on the "Cover It Live" box on the Newsarama page if you're interested and scroll down to check out the artwork. Marvel.com has a preview of Black Widow: Deadly Origin #1 up at their site... the mini-series' first issue ships November 4th. Marvel is thrilled to announce that DAREDEVIL #501 has sold out at Diamond (though copies may still be available at retail level) and will return with DAREDEVIL #501 SECOND PRINTING VARIANT! Marvel urges retailers to check their orders on DAREDEVIL, as the series continues to generate significant praise and immediate sell outs! What exactly is the Kingpin planning? How does Daredevil's new role affect those around him? Catch all the answers in DAREDEVIL #501 SECOND PRINTING VARIANT! Early solicits are now up at Newsarama, and if you don't mind spoilers, Daredevil #504 is among them. Full solicits will be posted here tomorrow at 12PM EDT. Daredevil: Lone Stranger TPB by Ann Nocenti and John Romita, Jr. The Man Without Fear becomes the Man Without Hope as Manhattan falls beneath the fangs and claws of Inferno! Losing everything in more than one kind of fire, DD leaves Hell's Kitchen to walk to and fro upon the Earth - but no matter where he goes, Mephisto's waiting for him! Inhumane experimentation and Inhuman secrets abound! Guest-starring Spider-Man and Freedom Force! Collects Daredevil (1964) #265-273. 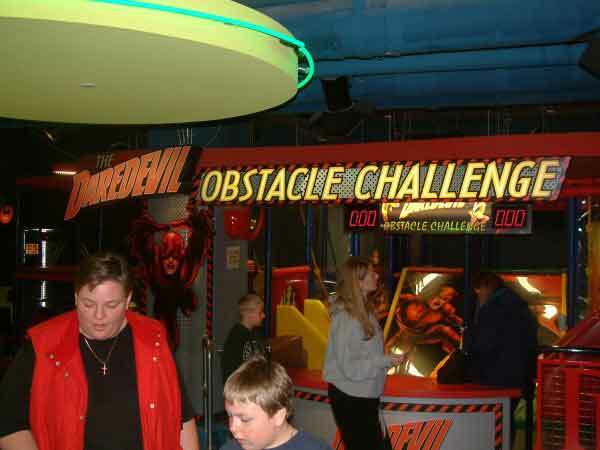 This is your parents' Daredevil, and you never knew they had it so good! DD goes cosmic when the first Thanos War spills into his new territory of San Francisco, with Matt Murdock's own boss as part of the invasion! Angar, Ramrod, the Disciples of Doom, and more menace for the Man Without Fear - and even help from Spider-Man and Captain Marvel might not make the difference! Then, it's back to New York for twin tilts at terrorism - fighting Hydra alongside the Black Widow, and Black Spectre alongside the Thing! Also featuring the Man-Thing, Nick Fury, Shanna the She-Devil, and the debut of the Silver Samurai! Collects Daredevil (1964) #101-125, and Marvel Two-In-One #3. She is Echo. Though seemingly kindred souls, their secret identities are very much at odds. Maya seeks out her father's killer, a man that Kingpin fingers as Daredevil. Can Matt Murdock clear his name before his new love becomes his executioner? Acclaimed writer/painter David Mack and artist Joe Quesada weave a tale of dangerous liaisons and forbidden romance that will change the Man Without Fear forever! Collects Daredevil #9-12. And it also looks like there will be new tradepaperback printings of Guardian Devil, Born Again and Man Without Fear in early 2010. Sad to hear that longtime Daredevil letterer Joe Rosen passed away. He and colourist Christie "Max" Scheele are who I considered to be two of the unsung heroes of Daredevil, whose names appeared on so many credits but never really got the attention as some of the other people who've toiled on this title. 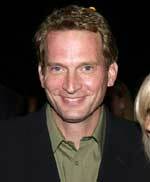 Check out his work on Born Again or Man Without Fear when you get a chance. * Daredevil #501 ships this week, so be sure to check out the REVIEWS, PREVIEWS and MESSAGE BOARD for everything on the first issue of the Andy Diggle/Roberto De La Torre/Matt Hollingsworth run! Watch for updates in the REVIEWS section. Shipping October 7th, Daredevil 501 is now available online for preview. It is the same preview from the Dark Reign: The List - Daredevil #1 one shot, but this one has the finished cover and recap page. * Reader FatalFrancis let me know that Brian Michael Bendis revealed some info on DD on his Bendis Tapes with Word Balloon. Daredevil will be "full-front" in New Avengers #60. 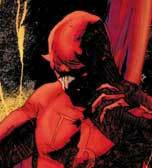 * A certain character was revealed in Thunderbolts #136... will this character be making an appearance in Daredevil soon? * Daredevil #500 placed #18 on the top 300 comics chart for September, with sales of approx. 73.5K, an increase of 78% over DD119 (due to multiple covers and the anniversary). Marvel is pleased to announce that Dark Reign: The List - Daredevil has sold out at Diamond (though copies may still be available at retail level) and will return with Dark Reign: The List - Daredevil Second Printing Variant! Red hot scribe Andy Diggle (Thunderbolts) begins his run on the critically acclaimed Daredevil with a jaw-dropping special featuring the art of superstar artist Billy Tan! Matt Murdock is now leader of the dreaded Hand, but he may not be able to make the sacrifices they require to take control of this dangerous group of assassins! 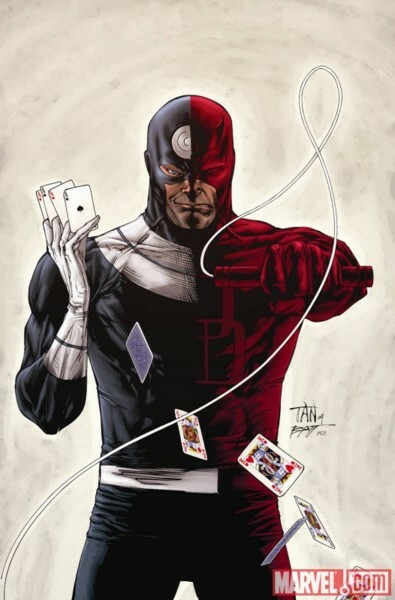 Norman Osborn sends Bullseye to terminate Daredevil, but when DD's arch foe is done, nothing will ever be the same! Dark Reign: The List - Daredevil Second Printing Variant features a brand new cover by Tan! Marvel urges retailers to check their orders on all Dark Reign: The List issues, as the one shots continue to generate significant critical acclaim and quick sell outs. Who is the mysterious assassin framing Matt Murdock for murder? How will Daredevil wield the Hand? Find out all the answers in Dark Reign: The List - Daredevil Second Printing Variant! If you follow me on Twitter (manwithoutfear), I posted a link to Part 2 of Ed Brubaker's interview with Word Balloon. Brubaker talks at length about his Daredevil run, including some behind-the-scenes info on supporting characters and his views on Matt's senses. He also talks about Cap, Criminal and more! World Access for the Blind's Daniel Kish appeared on the Derren Brown show in the UK recently and demonstrated his echolocation techniques. If you're wondering what the Tim Sale variant for Daredevil 501 looks like, here it is! December 2009 previews are now up on the site... check out info on DD503, Black Widow: Deadly Origins #2, a new Black Widow & The Marvel Girls limited series and the What If? Daredevil vs Elektra one-shot. Dave Wallace has a review up of this week's Dark Reign: The List - Daredevil #1... check it out! Check out the preview of the issue here. The new editing team on Daredevil is Stephen Wacker and Tom Brennan, and they have revealed (via Twitter) that the letter column will return to the pages of DD starting with issue #501... so if you want to submit letters to be considered, you can address them to mheroes@marvel.com! Optimum Wound spoke with former Daredevil artist Michael Lark, where they discuss many technical aspects of drawing... included are several pencil and ink pages from Daredevil 500! Media Release -- Marvel is thrilled to announce the historic Daredevil #500 has sold out at Diamond (though copies may still be available at retail level) and will return with Daredevil #500 Second Printing Variant! Eisner Award-winning scribe Ed Brubaker teams with a cavalcade of superstar artists, including Michael Lark, Klaus Janson, and more, to present the final chapter of his Daredevil opus! This leads directly into the shocking Dark Reign: The List- Daredevil and the game changing Daredevil #500, at Matt Murdock embarks on the path of no return -- and you can't afford to miss it! The Man Without Fear stands against his greatest challenge yet and one shocking decision will change Hell's Kitchen forever! Don't miss a special all-new story by Ann Nocenti & David Aja; a pin up gallery by today's most acclaimed artists; and as special reprint of a key issue by Frank Miller! Plus, get your first look inside Dark Reign: The List -- Daredevil by Andy Diggle & Billy Tan! 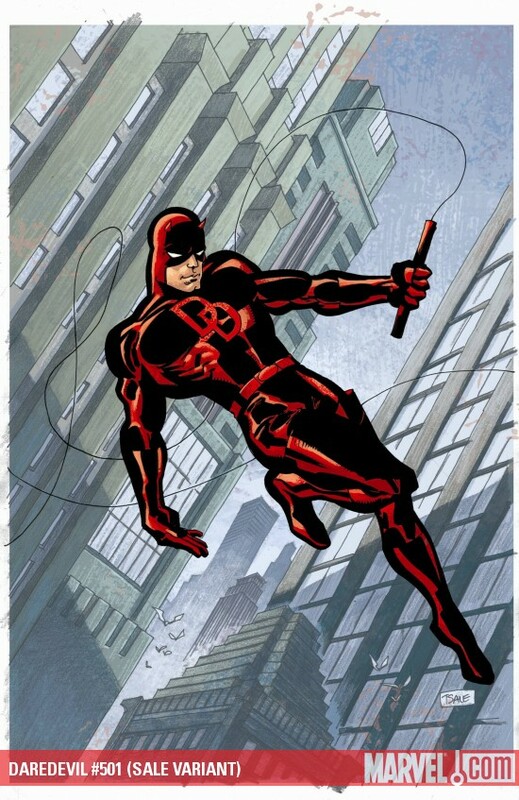 Daredevil #500 Second Printing Variant features the art of Patrick Zircher on the cover! Fans and critics are raving about Ed Brubaker's stunning Daredevil #500! Marvel urges retailers to check their orders on Daredevil, as the series continue to earn critical acclaim! How will Matt Murdock's life change as he comes face to face with the Kingpin and the Hand? Find out in Daredevil #500 Second Printing Variant! Here's a pretty cool animated trailer for a DD short produced by Fabulab in Denmark... anyone have a full copy of the movie? Hey Fabulab, contact me! Burbank, CA and New York, NY, August 31, 2009 .Building on its strategy of delivering quality branded content to people around the world, The Walt Disney Company (NYSE:DIS) has agreed to acquire Marvel Entertainment, Inc. (NYSE:MVL) in a stock and cash transaction, the companies announced today. Additional factors that may cause results to differ materially from those described in the forward-looking statements are set forth in the Annual Report on Form 10-K of Disney for the year ended September 27, 2008, which was filed with the Securities and Exchange Commission ("SEC") on November 20, 2008, under the heading "Item 1A.Risk Factors" and in the Annual Report on Form 10-K of Marvel for the year ended December 31, 2008, which was filed with the SEC on February 27, 2009, under the heading "Item 1A.Risk Factors," and in subsequent reports on Forms 10-Q and 8-K and other filings made with the SEC by each of Marvel and Disney. Marvel.com reveals its list of the Top 10 Daredevil villains... do you agree with their list? Part 4 of the Daredevil 500 Behind the Scenes continues at Marvel.com, and editor Warren Simons gives a well deserved spotlight to Michael Lark... with over 25 pages of great artwork. Day 3 of the Daredevil 500 Behind the Scenes feature is up at Marvel.com, and we get to see Brian Michael Bendis's artwork, as well as Joe Quesada! Full solicits are now up for Daredevil-related items in November... including DD 502, DD Noir HC, DR Elektra TPB, and BW: Deadly Origin! Day 2 of the Daredevil 500 Behind the Scenes feature is up at Marvel.com, this time with artwork by Geof Darrow and John Romita! Editor Warren Simons comments on the pinups for the issue that ships this week! Editor Warren Simons is revealing some behind the scenes goodness of Daredevil 500, and with part 1 at Marvel.com, he's featuring pinups by Rafael Grampa and Stefano Gaudiano! Thanks to Sillof, who pointed me to several images from CoolToyReview.com. That site has pics of new figures, including Black Widow, Nuke, Lady Bullseye, Daredevil Yellow, white Hand Ninja and many more... check it out! With the addition of "Video" on the main page, here's another new video to share... this time of Rex Smith as Daredevil from the 1989 Trial of the Incredible Hulk TV movie... check out Turk in action! It has a spoiler filled cover by Esad Ribic, and there will be a variant cover by Tim Sale! "It will come out this year... both Marvel and myself and everyone are kind of rallying the troops. What happened was... in this particular project everyone agreed but everyone was in the middle of other projects as well, and then were offered other projects on top of this... and this (book)... didn't need me to ship in a timely fashion, where World War Hulk what Klaus was working on and other things did... and things just derailed from there. "But, the pages that exist are amazing. Klaus Janson's pencils and Bill Sienkiewicz's inks... everyone who's seen them are amazed by those, but we are getting back to it quickly, because it's ridiculous that it hasn't shipped." The latest shipping changes from Diamond have some info on the Daredevil Omnibus by Bendis/Maleev Volume 2... apparently it will no longer contain Daredevil Ninja #1-3, and in its place will be Ultimate Marvel Team-Up #6-8. No reason was given for this change. Thanks to Dave for the tip. Daredevil editor Warren Simons speaks with CBR's Dave Richards about what's ahead for the title, and there's an 8 page preview of DD#119 as well, along with Roberto De La Torre's artwork for DD#501, in case you missed it. Joining writer Andy Diggle on Daredevil with issue #501 as artist is... Roberto De La Torre! Marvel released an image today, which features DD and other characters, apparently being watched by Norman Osborn... is Daredevil part of a story coming in September? CBR has a preview of the next issue of Daredevil Noir, by Alex Irvine and Tomm Coker! Running this site has given me the opportunity to be in contact with DD fans who have been inspired to make art based on the character. He can listen to your heart beat and feel your fears. It is a very good song, with each stanza appearing to be a different character - Daredevil, then Kingpin, then I think Karen Page. The Daves have sadly been long disbanded, but Bekka Eaton, the band's lead singer, maintains a website with some of their songs and luckily one is the Daredevil song! Here are the links - hope they can be added to the compendium! Thanks to Doug for the tip! For the past 6 months, I've been working on an interview with the Daredevil: Fall From Grace creative team of Dan Chichester, Scott McDaniel and Hector Collazo. I wanted to get back in touch with them to discuss the origins of the arc, and their comments about their work 15 years later. I hope you enjoy this 8 page interview and there are lots of cool surprises to check out as well. Just posted is my interview with the Daredevil Noir creative team of writer Alex Irvine and artist Tomm Coker. I hope you guys like this discussion on elements of the first issue of the series (SPOILERS AHEAD!). IGN has a lettered preview of next week's Daredevil #118... by Ed Brubaker, Michael Lark, John Lucas, Stefano Gaudiano and Matt Hollingsworth! 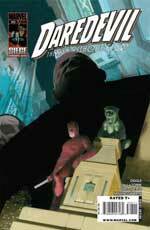 Newsarama has a first look at next month's Daredevil Noir #2, by Alex Irvine and Tomm Coker. Coming soon to this site... an interview with the creative team! Coming soon is The Marvel Art of Marko Djurdjevic Hardcover, which will feature over 200 pages of art and commentary. It will retail for $49.99 US and ships on July 1. Check out my new interview with writer Shane McCarthy and artist Martin Redmond, as they talk about working on the Astonishing Tales: Daredevil #1 digital comic for Marvel. If you haven't been following the Daredevil virtual series on MZP-TV, the latest episode 2x04 of Season 2 is now up... check out this interesting take on Daredevil. Any chance we'll see an Andy Diggle/Ed Brubaker co-written issue of Daredevil before Diggle takes over? I'm excited to see how Bru's arc ends and can't even imagine where Diggle plans on taking it. Think we'll get new villains? Or since Elektra is back, maybe have the two meet? We're all extremely excited about what the guys have planned, and while I don't want to give too much away just yet, I can say that it will have major repercussions on multiple heroes and villains throughout the entire Marvel Universe-- and individuals from Matt's past. Andy will take over in the fall, and although it sounds like it would be very dark and very terrific, the guys will not be co-writing the title. Thanks for the kind words, and keep your eyes peeled! Learn more about next week's debut issue of Daredevil: Noir, with this interview from Dave Richards at CBR with writer Alex Irvine! CBR has some previews up for next week's Marvel Comics, and included are fully lettered first looks at Daredevil: Noir #1 and Dark Reign: Hawkeye #1. 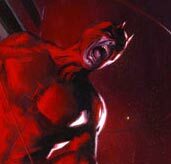 This year marks 45 years of Daredevil, and in honour of the anniversary, I present my feature from 2004 on DD's 40th anniversary. If you've never read it before, have a look at what a lot of past DD creators thought of their stint on Daredevil. JQ: Hey Andrew! Glad to hear that you've been digging DD! If you thought that Brian Bendis left Ed Brubaker with a helluva cliffhanger, wait until you see what Ed's got planned for Andy! No announcements yet about the art team -- it's top secret for now -- but how about a nod of the cap to the terrific job Michael Lark has done over the past three years? Michael's work has been beautiful, and with guest artists such as David Aja, Lee Weeks and Clay Mann, we know DD fans have come to expect amazing artwork from the title, and we don't expect they'll be disappointed. Hang tight, we'll have an announcement coming up! Daredevil-related solicits for June are now posted in PREVIEWS! It's confirmed... Andy Diggle is the new writer on Daredevil with issue #501, and DD will be going back to its original numbering with issue #500! Lots of info here, including the cover to DD 500! Thanks to Angela Bowie for the info! Via @PAPPADEMAS on Twitter, check out this promo shot of Ben Carruthers and Angela Bowie (as DD and Black Widow) for a proposed Daredevil TV series from 1975! Cup O'Joe at MySpace comic books has some more images from the forthcoming Dark Reign: Elektra series. Scroll down near the end of the article for several images by Clay Mann. Comics Bulletin has an exclusive first look of next week's Daredevil #116... Some nice David Aja artwork! WonderCon 2009 in San Francisco runs from February 27 - March 1, and will we see some Daredevil-related news or announcements there? If you've read Amazing Spider-Man #587 this week and seen Matt Murdock's appearance as Peter Parker's lawyer, you may want to check out a free digital comic of Amazing Spider-Man Extra entitled "The Spartacus Gambit", which shows how Matt helps Peter in court before what happens in ASM #587. In case you are wondering why Daredevil #116 is not amongst the previews for next week's books, or doesn't appear on the shipping list... it looks like it will be delayed at least a week. Marvel.com has it listed for March 4. Daredevil #117 is still listed for March 25, for now. Newsarama has an interview with Dark Reign: Elektra writer Zeb Wells. There was also an interview with Wells at Marvel.com on the 10th, in case you missed that. May 2009 comics are now posted in PREVIEWS, with lots of titles that relate to DD... but oddly enough, there's no actual Daredevil comic solicited! Comic Book Bin's Andy Frisk has posted a review of the first volume of Essential Daredevil, so if you've never had a chance to check out the early issues of DD, see what Andy has to say about the reprinted collection. Surprisingly, there wasn't much Daredevil news announced at the New York Comic Con on the weekend. Aside from the Ultimate Alliance info posted on the 6th, there was only a bit of news about End of Days from the Cup O'Joe panel, where it was revealed that the first issue is done. Once more issues are completed, then it will be solicited. Maybe with solicits coming out this month we will learn just what will be happening with Daredevil "500". Here's a trailer for the forthcoming Marvel Ultimate Alliance 2. Black Widow and Daredevil appear briefly in it... clip courtesy of GameTrailers.com. Marvel.com has a new article online, which features some of the past battles of Daredevil vs Kingpin, in preparation for next issue. CBR's "Top 25 Vs." list was revealed this week, and in case you missed it, Daredevil vs Kingpin ranked #10 and Daredevil vs Bullseye was #7. Word Balloon speaks with Daredevil writer Ed Brubaker. The interview is mainly about Brubaker's Incognito, Criminal and Angel of Death, but some DD-related talk happens about 8 minutes from the end of the interview... mainly about DD artist Stefano Gaudiano. UPDATE: There's a new interview up with Ed Brubaker at Sci-Fi Wire... where he talks a bit about DD and if he would be involved in a DD movie. April 2009 solicits are now up! DD118, DDNoir1, Dark Reign Elektra #2, Deadpool Suicide Kings #1, Wolverine First Class #14! Another year has passed and the site is one year older. Many thanks to all of you who make the site a regular destination during your day. I'm currently working on a really cool interview and I had hoped it would be complete by today. But once you see the interview when it's done, you'll understand the delay. Lots of DD stuff to look forward to this year! Images of the Punisher/Daredevil Diorama are now online... check them out! Thanks to Kevin for the tip. Hopefully all of you can see this... the site was down for a short period of time and you may have not been able to see anything while the DNS propagated the recent server change. So, good news on the server front. As you may know, the site has been hosted by the good folks at Comic Book Resources for almost 10 years now. Problem was, the server was becoming realllly slow and timing out a lot, as many of you have experienced. Today my site was moved to a brand new server, that has been promised to be 20x faster than the original... so I hope you guys love the new speed and hopefully posting on the board is not the problem it was before and page load times are minimal. Daredevil colourist Matt Hollingworth has updated his web site with pics of DD#107-112 (along with other titles he's currently working on). Have a look at the DD gallery!